Top 2 Inov 8 Weightlifting Shoes Reviewed- Includes Video! There’s something a little different about the Invo 8 weightlifting shoes, their range of shoes offer a slightly lower heel compared to other lifting shoes and they are light, 5-6 oz lighter than Nike Romaleo’s and their other closest rivals the Adidas Adipowers, featuring a cutting-edge design and old lifting shoe comfort, the Inov 8 lifting shoes are worthy of some serious consideration. 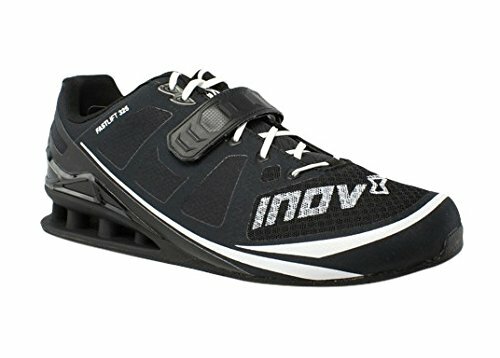 In this review, we’re going to take a closer look at the popular Inove 8 FastLift 325 and their most recent addition to the range the Inov 8 FastLift 400 BOA, we’ll find out what makes these shoes so appealing, and just why are so many people choosing them over the more well-known Nikes and Adidas? But First, take a quick look and compare Inov 8’s two top lifting shoes in our comparison table. A hybrid shoe is another name given to a cross-training shoe, Hybrid shoes are typically lighter, have a lower heel and are geared towards the cross-training market, that’s not to say they’re not great for lifting alone but with a lower heel than standard, some Oly lifters might stay away and go for something like a 0.75″ or even a 1″. Just because it says cross-training don’t go thinking shoes like the Inov 8 are great for running, you may get away with burpees and box jumps but running is a no in these shoes. A solid TPU raised heel will make any type of running difficult, there’s absolutely no compression with a TPU heel, causing a harder heel strike, users have complained the shoe “interfered with the natural pronation and supination of the ankle during running”. Mesh Material - Delivers ventilation to the wearer during intense sessions. EHC Technology - External Heel Cage, provides a robust platform with durable properties for structured support. Meta-FlexTM - Entwined within the forefoot of the outsole, enhancing flexibility and comfort. Power-Truss System - Delivers stability, support and strength for lifts. TPU Midsole - Ensures a robust platform is available to the wearer. These shoes are very light for a weightlifting shoe, 11oz to be precise, compared with 17oz of the excellent Pendlay Do-Wins and 16.8oz of Nike Romaloes, the Adipowers also weigh in at around the 17oz mark. Mid-weight Lifting shoes such as the Romaleos do give you the foot planted solidly feeling because of the added weight of the shoe, this planted foot feeling might be something many people will miss with shoes as light as the Inov’s. But if you need a shoe that works for both Oly lifting and dynamic workouts then the lighter more versatile shoe should prove a winner. As we touched on earlier the Inov 8 weightlifting shoes are a little lower than standard. Today we see most lifting shoes with a heel of 0.75″ Romaleos, Adipows the Do-Win all have the standard heel 0.75″ heel height a height that suits most lifting seniors. Some guys even find a heel of 0.75″ is ok for cross training but mostly this is a good height for squats and Oly lifting. The Inov 8 have a heel height of 0.65″ which is useful for low bar squatting as the athlete doesn’t need to get so low to the ground and it also a good transitional height for beginners who are buying their first raised heel. The 325 Lift is one of the lightest shoes you can get your hands on that is offered with an elevated heel making it a great choice for most CrossFit exercises. The Inov 8 325 uses short plastic TPU tubes in its heel. This design tends to save a lot of material and will help to keep the shoe weight down. TPU heels are becoming the industry norm, they are non-compressible which make power delivery second to none. Many cross-training type shoes incorporate an EVA heel, EVA heels are slightly more compressible and are a favored choice amongst some lifters but their durability and compression issues keep the more serious lifters away. If you want a heel that’s going to offer you maximum power delivery then Inov 8’s PowerTruss, stable pillar base will defiantly give you what you’re looking for. The upper of the shoe is mostly made out of thin synthetic material and mesh. This will help to keep the weight of the shoe down and makes them breathable and flexible. The upper of the shoe is what gives the shoe its flexible nature, no hours needed to break these in as you would find with some heavier leather lifting shoes. The downside of a lighter more flexible shoe is the stability you lose for heavier weightlifting exercises and squats. The 325’s synthetic and mesh upper will also be less durable than a heavier, stiffer lifting shoe. The rubber sole on the shoe is almost completely flat and is said to provide a good grip on the platform. The sole uses the ‘Meta-Flex’ technology, which is a shallow groove on the sole to aid flexibility, allowing the toe box to move independently from the heel. The front of the shoe has toes groves and the toe box is constructed slighter wider, letting you spray your toes a little for extra grip. 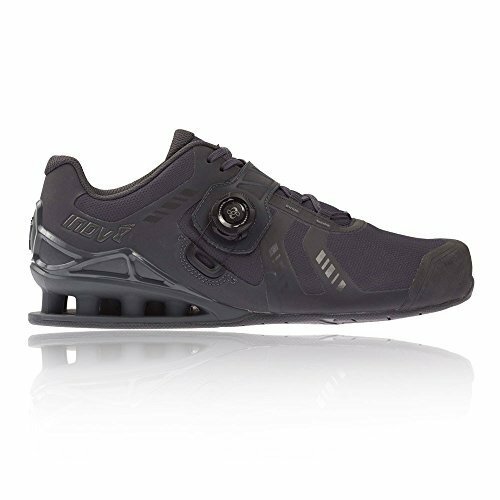 As we see on most lifting shoes the Inov 8 comes with a singular medial strap. It’s not a particularly wide strap and yes it’s in keeping with the weight-saving design but you lose tightness and security. A singular narrow strap will help to keep the foot secure, but if you like the feeling of being fully secure in your shoes, go for a wider single strap or a double strapped shoe. Overall this a very good weightlifting shoe, it is sturdy enough to help improve your posture squats and lifts, but if your looking for a shoe solely for Oly lifting or powerlifting then maybe you might want to look for a less flexible, stiffer mid-weight shoe. The 325 is the lightest weightlifting shoe on the market, it’s also very flexible and because of this, it seems best suited to CrossFit WOD’s. Whoa, I like the looks of this lifting shoe, 3 oz heavier than their previous two cross-training shoes, the Fastlift 400 is targeted more toward the Oly and powerlifting market. The shoe employs the latest in lifting technologies to ensure amazing grip and stability, their first shoe optimized for lifting. Foot security seems to of been top on their list when designing the 400, your foot will now be securely locked in by the shoelaces the medial strap and the BOA. Just like the earlier versions the FastLift, The 400 features the PowerTruss TPU heel, so you can be sure power delivery will be excellent. With a flat outsole and a heel that features dimples which act like suction pads, you can be sure you are going to be lifting from a stable platform. An in-depth review of this shoe will be available soon, I have a feeling their new weightlifting shoe is going to be quite popular. I’ll leave you with a quote from someone who owns a pair of the 400 BOA. Rep Fitness Adjustable Bench Review – With Video!